Both Chrome and Firefox can restore bookmarks you’ve deleted, but Chrome doesn’t make it easy. Chrome contains a single, hidden bookmark backup file. You can only restore the backup file manually, and that file is frequently overwritten. Chrome’s bookmark manager doesn’t have an Undo option. If your finger slips, you could delete an entire folder full of bookmarks with no obvious way to recover them. If you’ve made a backup with the export option, you could import the backup—but that backup may already be out of date. First thing’s first. If you’ve accidentally deleted a bookmark, close all open Chrome windows, but do not reopen Chrome. If you’ve already closed Chrome, leave it closed. Chrome saves a single backup of your bookmarks file, and it overwrites that backup each time you launch Chrome. The folder contains two bookmark files—Bookmarks and Bookmarks.bak. Bookmarks.bak is the most recent backup, taken when you last opened your browser. Note: If you don’t see the .bak file extension and just see two files named Bookmarks, you’ll need to make Windows show the extensions for files. In File Explorer, head to File > Change Folder and Search Options > View, and then clear the “Hide extensions for known file types” check box. If you need more details, check out our guide to making Windows show file extensions. Rename your current Bookmarks file to something like Bookmarks.old. This just preserves a copy of the current bookmarks file in case you need it. Rename your Bookmarks.bak file to just Bookmarks (removing the .bak extension). This makes Chrome load the backup file when you open it. Open Chrome, and see if you’ve managed to restore the missing bookmark. If these steps don’t restore your bookmark, it means the backup file was saved more recently than the bookmark went missing. Unfortunately, it also means you’re out of luck, unless you’ve got a backup of your PC you can pull an even older backup file from. Just note that using this process will also remove any bookmarks you’ve created since you last launched Chrome. Firefox users have it a lot easier. 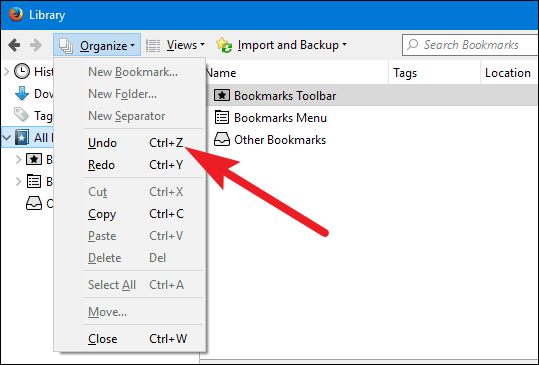 If you just deleted a bookmark or bookmark folder, you can just hit Ctrl+Z in the Library window or Bookmarks sidebar to bring it back. In the Library window, you can also find the Undo command on the “Organize” menu. 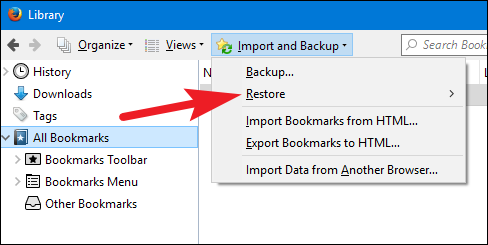 If you deleted the bookmarks a few days ago, use the Restore submenu under Import and Backup. Firefox automatically creates a backup of your bookmarks each day and stores several days’ worth. Just be aware that restoring the backup will completely replace your existing bookmarks with the bookmarks from the backup, meaning that you’ll lose any bookmarks you’ve created since the backup was saved. To avoid losing any important, new bookmarks, you also can use the Export Bookmarks to HTML option before restoring the backup. After the backup is restored, you can import the HTML file or view it in Firefox. 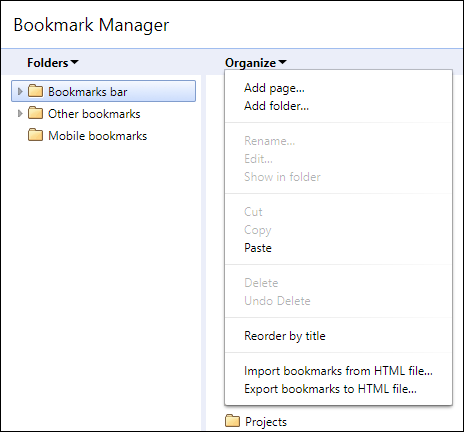 If you value your bookmarks, it’s a good idea to make regular backups with the export feature in your browser’s bookmark manager. If you ever lose your bookmarks—or have your hard drive fail—you can restore your bookmarks from the backup using the import option in any web browser.